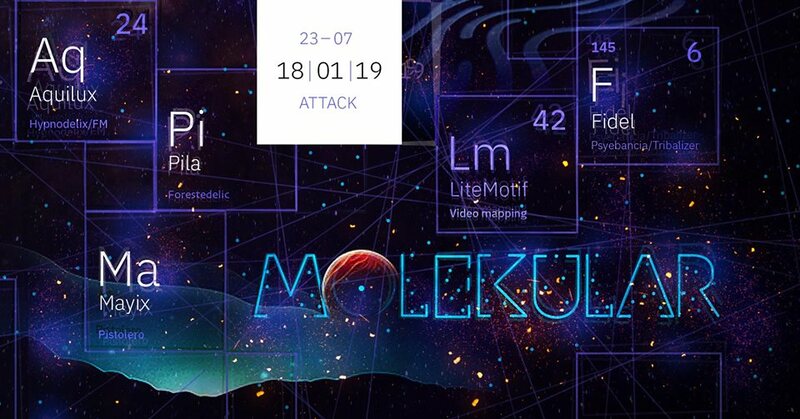 U klubu AKC Attack, u petak 18.01.2019. na rasporedu je prvi Molekular, a riječ je novom serijalu partija u organizaciji Pistolero Recordingsa fokusiranog na underground i futuristički psytrance zvuk. Na prvom Molekularu vrti provjerena domaća dj ekipa (Pila, Fidel, Mayix i Aquilux), dok je za video zadužen LiteMotif. Pila kao psytrance dj prvi put nastupa na Seasplash Festivalu 2007. godine na flooru Ministarstva Psihodelije, a u idućoj sezoni postaje resident DJ na istoimenim večerima u Močvari. Od tada često svira na mnogim psy zbivanja u Zagrebu i šire. Zvuk relativno mijenja iz seta u set, ali uglavnom pušta nešto mračniju kombinaciju fullona i foresta. Trenutno je label DJ slovenske etikete Forestdelic Records. Fidel je prekaljeni majstor psytrance zvuka kojeg vrti skoro 20 godina (nekima je znan i kao Sekkt sa Tribalizer psy serijala). Fidel će dubokim forest brijama svim prisutnim plesačicama i plesačima osigurati ključanje mašte i kaleidoskopsku sliku na potezu mozak-oko. Mayix (aka Zmayo) odlično vrti razne elektronske stilove, a na Molekularu će odraditi kvalitetnu dark/fullon setčinu. Dugo je godina na sceni kroz Pistolero partije, a osnivač je i urednik Pistolero Recordingsa na kojem okuplja glazbenike iz cijelog svijeta. Aquilux je, osim što vrti psytrance, i dio chill/downtempo dvojca Chillin Glow, te rezident DJica na Hypnodelix večerima te jedna od organizatorica FreeMental Festivala. Muzika koju možete očekivati u njezinim setovima može se opisati kao night fullon. LiteMotif je video projekt utemeljen isključivo na DIY principima. Radi na klupskoj video scenografiji, kreiranju videa i video scenografije kako za velike festivalske pozornice, tako i za klubove. TP.forum / The sound of the tribe / Journey - 'Bubblez' out now on Free-Spirit Records! Nikki S - 'Experts' out now on Alchemy Records! TP.forum / The sound of the tribe / Pan - 'Goa Creamsicle' out now on Reincarnations Recordings! Pan - 'Goa Creamsicle' released today on Reincarnations Recordings is straight in at number 14 in the Beatport Psy-trance hype chart! Well done Pan Martinez! Awesome job for your first solo release! Nikki S - 'Experts' out 03/12/18 on Alchemy Records! TP.forum / The sound of the tribe / Re: Omsphere - 'Just A Plastic Bottle' out now on Free-Spirit Records! TP.forum / The sound of the tribe / Omsphere - 'Just A Plastic Bottle' out now on Free-Spirit Records! OMSPHERE -'Just A Plastic Bottle' it out now on Free-Spirit Records! The soundtrack to the thought-provoking short film of the same name, 'Just a Plastic Bottle' is a driving number from Journey aka Jay OM's progressive trance project Omsphere. Just as the film was produced to highlight the impact of plastic pollution, so the track's haunting basslines take the dancefloor on an atmospheric adventure as we cruise along like a plastic bottle in the ocean, unaware of the undertow to come. An ethereal and edgy track, capped with voices from the ocean, designed to make you think about our relationship with the environment and the responsibility that comes with it. TP.forum / The sound of the tribe / Tron - 'Encrypted' EOP out now on Free-Spirit Records! TRON - 'Encrypted' EP on Free-Spirit Records has soared into number 3 in the Beatport chart! Mindbenderz debut album 'Tribalism' is out Monday 29 October on Iono-Music! TP.forum / The sound of the tribe / Outer Signal - Tropical Mode - OUT NOW !! 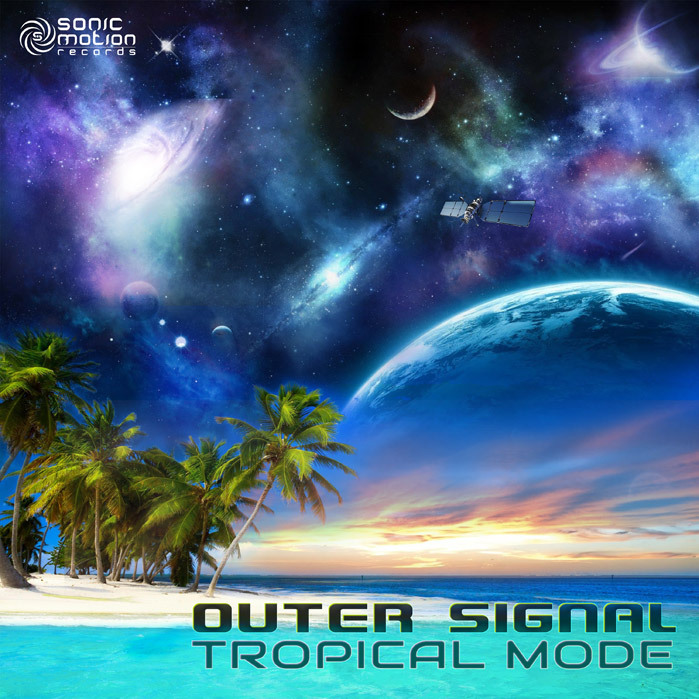 Outer Signal - Tropical Mode - OUT NOW !! With 3 hauntingly melodic full-on pieces, he is ready to take you on a voyage into his universe, one where throbbing basslines meet highly ritualistic arrangements, flanged guitars and FM bells which will ring and get you dancing and dreaming at the same time.. So get ready to take a trip, to sing the same refrain.. put some Outer Signals in your veins!